One of the reasons for the success of multinational enterprises in their ability to create in their supranational organisations "internal markets" which eliminate the imperfections of external world markets caused by tariffs on trade, restrictions on the flow of capital, information costs and so on. The method multinationals use to create and sustain internal markets is transfer pricing. Multinationals use to their advantage the difference between nominal accounting and real transfers from their head offices to a subsidiary in different countries to overcome transaction costs and restrictions on trade and capital flows. 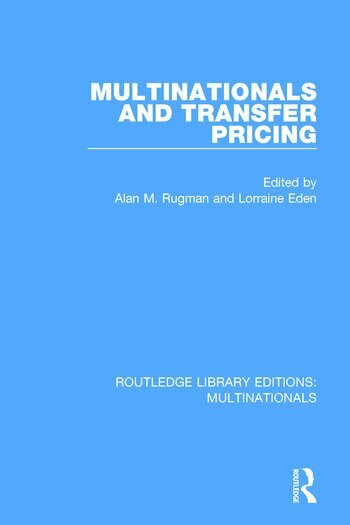 This book, first published in 1985, examines these and other aspects of multinationals’ use of transfer pricing. It puts forward original thinking and research findings by leading experts in this area. Empirical results are related to the activities of multinationals in less developed countries. This volume covers the economic theories of transfer pricing, accounting and fiscal practices and implications for government policies and regulations, and will be of interest to students of economics and business studies.